Latest News: After determining that four Planning Commissioners had financial conflicts of interest that would normally prohibit them from taking part in discussions about this project, a little-known provision of state law was used whereby at their September 13 meeting the four “drew lots” to select one to join the three unconflicted Commissioners in order to have a quorum available to hear the Koll Center Residences proposal. The long-awaited Study Session (which had started on January 18, 2018), was then re-scheduled for November 8 at 5:00 p.m. — however, even that plan had to be cancelled due to the resignation on September 25 of Planning Commission Secretary Bill Dunlap (one of the four members needed to hear the Koll application). With a new Commissioner having been appointed, the study session was held on January 31 (see “Recent Events,” below). 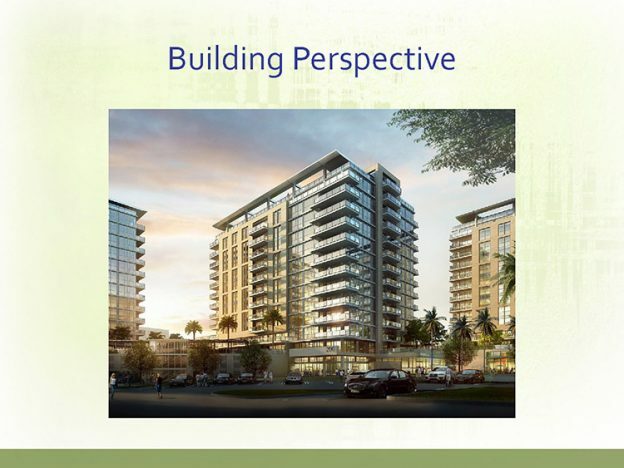 Project Overview: The Koll Center Residences is a proposal to add 260 luxury condominium residences in three 160 foot tall towers in what is now the surface parking lot of an office campus near the corner of Jamboree and Birch in the Airport Area. See the city web page devoted to this project for further details and links to additional documents. The towers are described on that page, and in the EIR, as “13 stories” but they appear to be 13 stories of residential on top of two of above-ground parking, for a total of 15. Why We Are Watching: This project raises multiple issues about height, density, and compatibility with neighboring uses, including the viability of the current General Plan’s vision for adding residential uses to the Airport Area, and whether it is being properly implemented. SPON feels the project is out of character with the office park environment in which it is being proposed, and that any further consideration of it should be deferred until the pending General Plan Update has been completed — hopefully providing a clearer and better thought out vision for the future of the Airport Area. The application for the project is expected to return to Planning Commission for them to make a recommendation to the City Council. The date for that has not yet been set. The park component of the project will likely need to go to the Parks, Beaches and Recreation Commission for their advice to the Council. Again, a date for that has not yet been announced. If the Newport Planning Commission recommends approval, the project will go to the County’s Airport Land Use Commission for their finding of its consistency or inconsistency with airport planning. The final decision on the project will lie with the City Council. January 31, 2019: Planning Commission held a special study session on the project application, starting at 4:30 p.m. (see public notice and video). Agenda and staff report here. In yet a another twist, the newly-appointed Planning Commissioner, Curtis Ellmore, revealed that his real estate company leases a building at 5000 Birch, adjacent to the project. As a result, he and three of the other conflicted Commissioners drew cards to decide who among them would hear the matter. Commissioner Lee Lowrey (who is conflicted because of a membership interest in the adjacent Pacific Club) was selected by the random process. The study session continued with Commissioners Zak, Koetting, Weigand and Lowrey listening to comments from staff, the applicant’s team and members of the public. At the end of the meeting, the applicant, Bill Shopoff, said he would “make some adjustments” based on what he’d heard. A good way to prepare for the study session was to review the comment letters received regarding the Draft Environmental Impact Report, and the City’s responses to them, which, due to the long delay have been available for more than a year, now. The new staff report referenced the report posted in 2018 as well as additional letters received since then. Still more letters, pro and con, were received in connection with the January 31 meeting. January 17, 2019: Staff obtains Planning Commission agreement to change previously announced January 31 study session time from 6:30 p.m. to 4:30 p.m.
November 27, 2018: The City Council appoints Curtis Ellmore to fill the vacancy on the Planning Commission. November 8, 2018: The 5:00 p.m. re-do of the Study Session (that originally began on January 18) was cancelled due to the unexpected resignation (on September 25) of Bill Dunlap, one of the four Planning Commissioners needed to hear the application. September 25, 2018: Planning Commission Secretary Bill Dunlap, one of the four Commissioners constituting the quorum expected to hear the Koll Center Residences application, submitted a letter of resignation, informing the City medical issues forced him to leave the Commission. The City clerk has since posted a vacancy notice. September 13, 2018: The City needs a quorum of four Planning Commissioners to take action on the Koll Center Residences proposal. However, four of the current Commissioners — including the previously announced Commissioner Kramer — were found to have financial conflicts of interest that would normally prevent them from discussing the matter. That left only three who could vote, which is less than a quorum. In such a circumstance, a rarely-used provision in California’s ethics laws allows a quorum be be achieved by adding a conflicted Commissioner to the decision-making panel by a “drawing of lots.” This was done at the Commission’s September 13 meeting, with Chair Peter Zak (who has an interest in a business with offices across Von Karman from the project site) drawing the “winning” card. The panel hearing the Koll Center Residences application will thus consist of Dunlap, Koetting, Weigand and Zak. May 31, 2018: The four Commissioners who are allowed to hear the Koll proposal (Koetting, Dunlap, Kramer and Weigand) were expected to meet for a special afternoon public study session about the project. However, the meeting was canceled, purportedly due to an inability to to assemble a quorum, and needs to be rescheduled. A new date has not yet been set. May 24, 2018: The City announced the long-planned May 31 study session has been canceled. Speculation is that one of the four Commissioners needed to hear the matter learned he would have been unable to attend. This likely will change the timing of the previously-announced June 21 hearing date, as well. March 22, 2018: In his report to the Planning Commission at the end of their meeting, the Community Development Director selected May 31 at 4:00 p.m. as the date and time for a study session on the Koll Center Residences proposal. Of several dates suggested, it was one of the few on which the four Commissioners able (and needed) to hear the matter thought they could get together. The Director said the PC hearing on the application would come on June 21. January 18, 2018 @ 6:30 p.m.: The Newport Beach Planning Commission started to hold a public study session on the project, long deferred from the date that had been scheduled and announced in the DEIR: October 19, 2017. The staff report included responses to the comments on the Draft EIR received on or before November 13, 2017. However, after a brief staff report, and introductory comments, the applicant asked for the session to be postponed due to uncertainty over which Planning Commissioners would ultimately be able to vote on the matter (several of them having financial conflicts of interest). A video of the meeting is available, with the Koll Center Residences segment running for about 17 minutes starting at 1:43. At 1:55:50 the Assistant City Attorney makes the announcement that one more of the Commissioners had to leave the room due to a potential financial conflict of interest. The discussion about future scheduling conflicts begins at 2:06:45. January 9, 2018: Responses to the public’s comments on the DEIR were posted on the City website. November 13, 2017 @ 5:00 p.m.: Due date for written comments regarding the accuracy and adequacy of the DEIR. In the Final EIR, the City is required to provide written responses to comments submitted by this deadline. Comments about deficiencies in the EIR can continue to be made up until the final project approval by the City Council. However, there is no legal requirement for a formal response to comments submitted after November 13. October 31, 2017: As promised at the previous night’s developer presentation, the City amended its DEIR comment extension notice to indicate written comments on the adequacy of the DEIR will be accepted through November 10 (later corrected, in view of the City Hall being closed on that date, to the next business day, November 13). October 30, 2017: At the City’s invitation the developer provided a roughly hour-long presentation about the project in the Friends Room at the Central Library, followed by questions and answers (but not comments) from the audience. SPON feels this City-invited sales pitch was a poor substitute for the more objective and on-record study session before the Planning Commission that had been previously announced (but cancelled without explanation) during the period the public is expected to comment on the Draft EIR. At this meeting, City staff announced the public comment period would be extended an additional seven days, to November 10, and that a Planning Commission study session on the project had been set for January 18, 2018. There was also an understanding that the developers PowerPoint would be made available on the City’s website. October 18, 2017: City announced extension of due date for written comments on the DEIR from October 27 to a new deadline of November 3 at 5:00 pm. City also announced a “public forum” to be provided by the developer on October 30. This is a substitute for the October 19 public study session before the Planning Commission which had been announced with release of the DEIR, but cancelled without explanation. September 13, 2017: The Draft EIR was released for public review. Comments submitted by October 27 will receive a written response in the Final EIR. The public can continue to comment on the EIR until such time as it is certified, but the City is not required to provide a formal response to comments made after October 27. Further details are available in the City’s announcement. January 18, 2017: A scoping meeting for the project’s Environmental Impact Report was held with comments due by February 2. This entry was posted in News, Watch List and tagged airport area, high-rise, koll center, Land Use on April 1, 2018 by Jim Mosher.